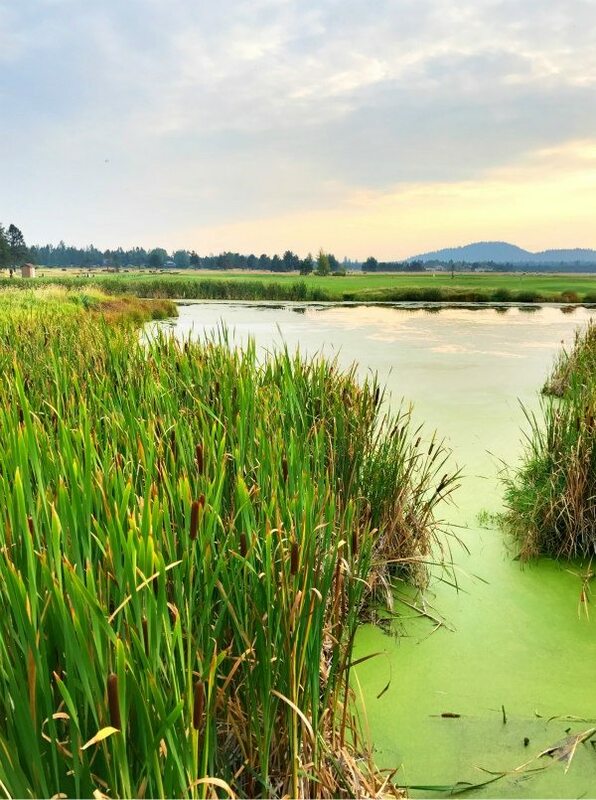 Today I’m sharing about a fabulous place to vacation: Sunriver Resort in Oregon. 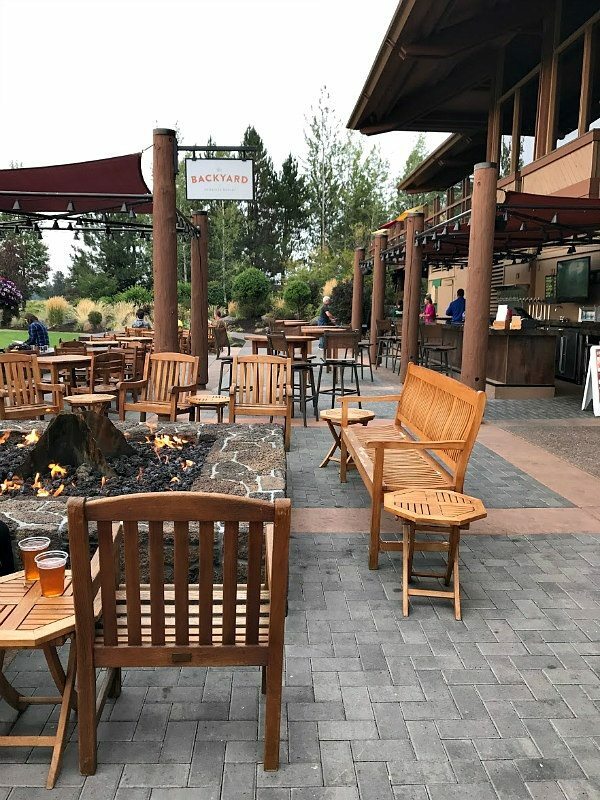 I recently visited Sunriver Resort with a group of blogging friends. 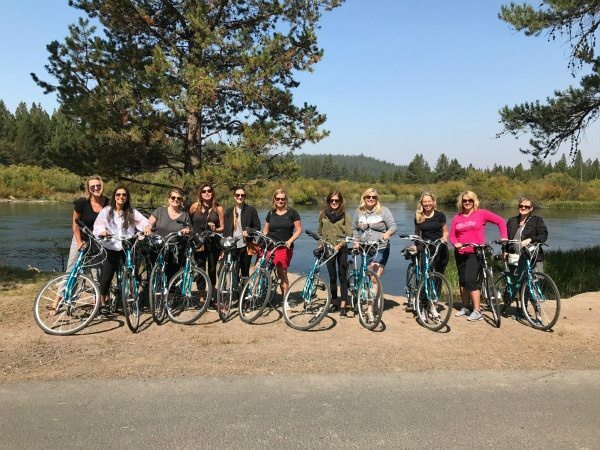 We were there to have a weekend business retreat, but we were also there to experience all that Sunriver has to offer. I hadn’t been to Oregon in many, many years. What a delight it was. The air was crisp and cool in mid-September, but it was still warm enough to do loads of outdoor activities. 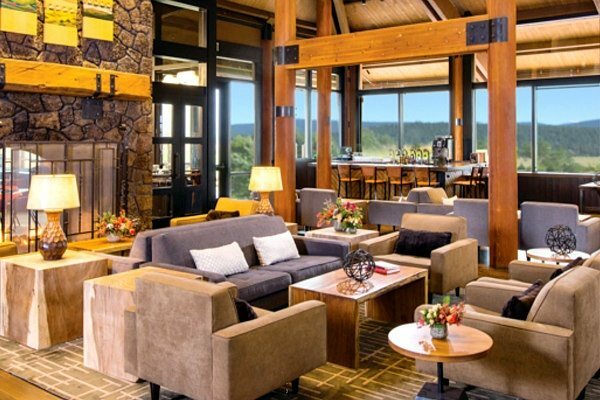 At the center of it all, Sunriver Resort has a lodge with accommodations. 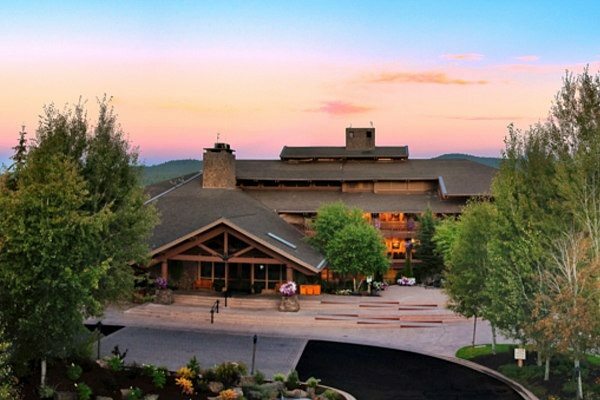 You can certainly stay at the lodge- where you’ll have access to the amenities that I’m going to share below- or you can choose to reside in one of the many rental houses or condos scattered all around town. We stayed in a rental house- which I’ll be sharing about tomorrow. If you book your accommodations (lodge, cabin, condo or house) through Sunriver Resort, you have access to the resort’s shuttle system. Just call them to arrange a ride (it’s free), and they’ll come pick you up and take you where you need to go. 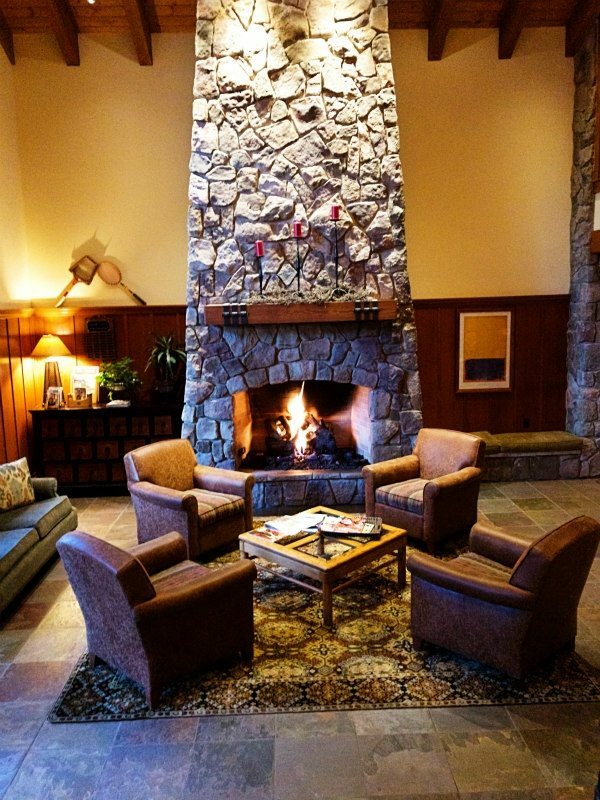 If staying at the lodge, you can visit the main lobby to find this relaxing area with a large fireplace, restaurant and bar. The pool area at the lodge is fabulous. …complete with a fire pit for chilly nights. Here are some of the gorgeous views from the lodge. The sunsets are fabulous. This is looking out toward the golf course and the meadows filled with horses. 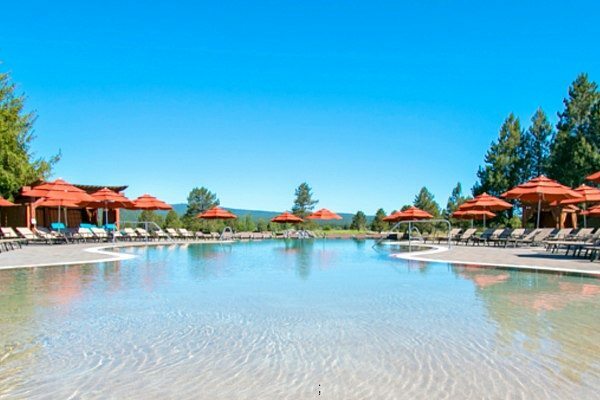 This is the Sage Springs Club and Spa- which is a short walk from the main lodge. It offers massage and beauty treatments, salon and bridal treatments, and there is a fitness room there too! I experienced a most-excellent facial while I was there. 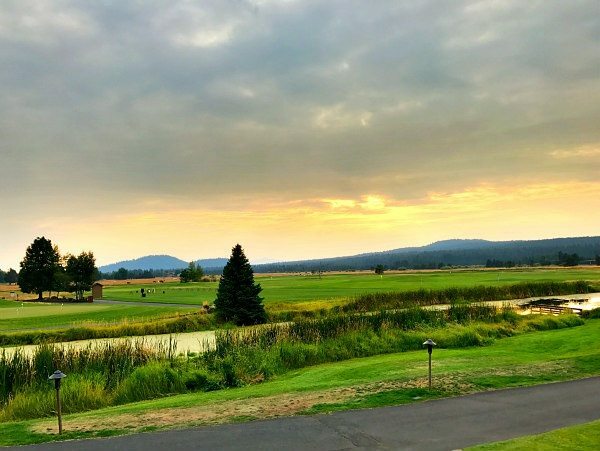 There is plenty to do in Sunriver. 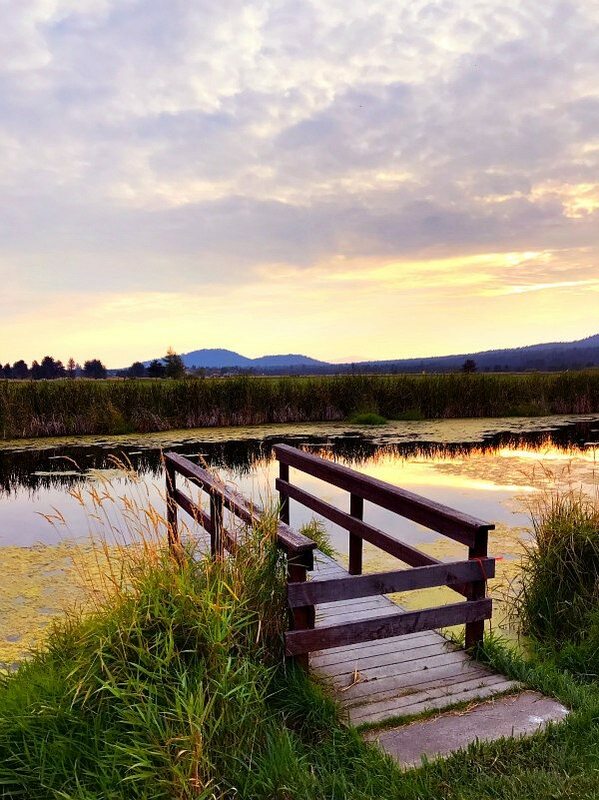 One of the reasons I think this is a great place for a family vacation or reunion of a large group is that there are so many things to do in Sunriver that everyone can choose to do what they want. There is something for everyone. And of course, it’s a beautiful place to just relax and chill too. There are four pristine golf courses that are regularly used for PGA and other golf classics. It’s a huge destination for golfers (there were several on my flight who were headed to Sunriver for golfing). 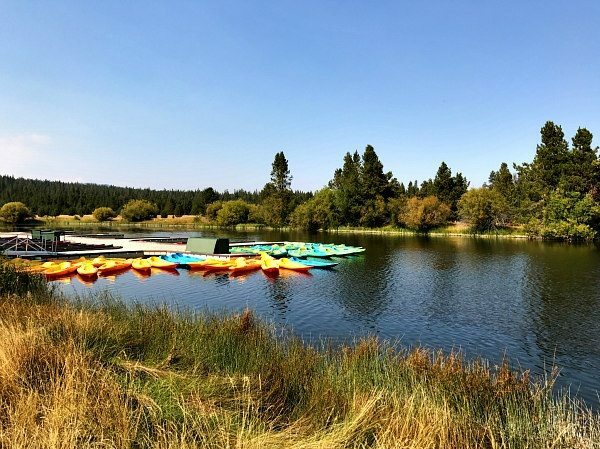 You can head down to the marina to rent canoes, kayaks and river rafts… and float down the DeChutes River. The marina will bus you up the river, and then let you float and paddle at your leisure all the way back to the Marina to return your boats. Bring a lunch and paddle off into one of the many offshoots of the river to anchor yourselves and take in the beauty of the river. 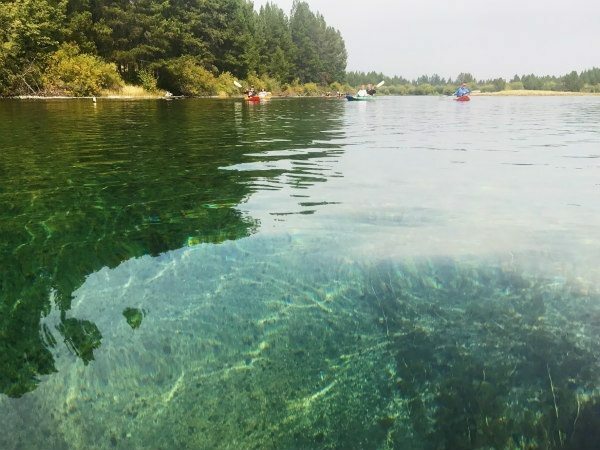 If you’re wary of kayaking by yourself, you can rent a double kayak! 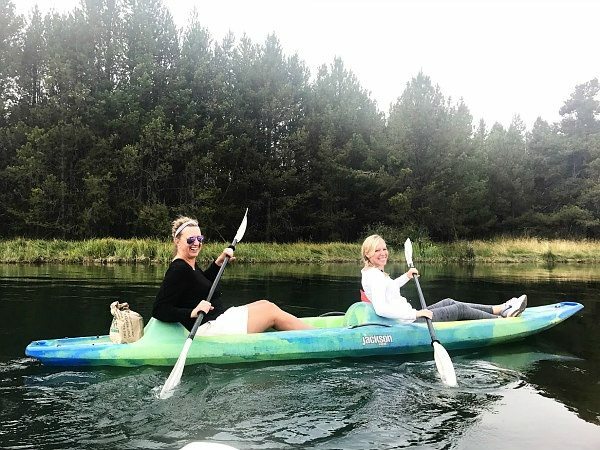 These are my friends Heidi and Amanda team-paddling down the river. I had never heard of Hydro Flask prior to coming on this trip. 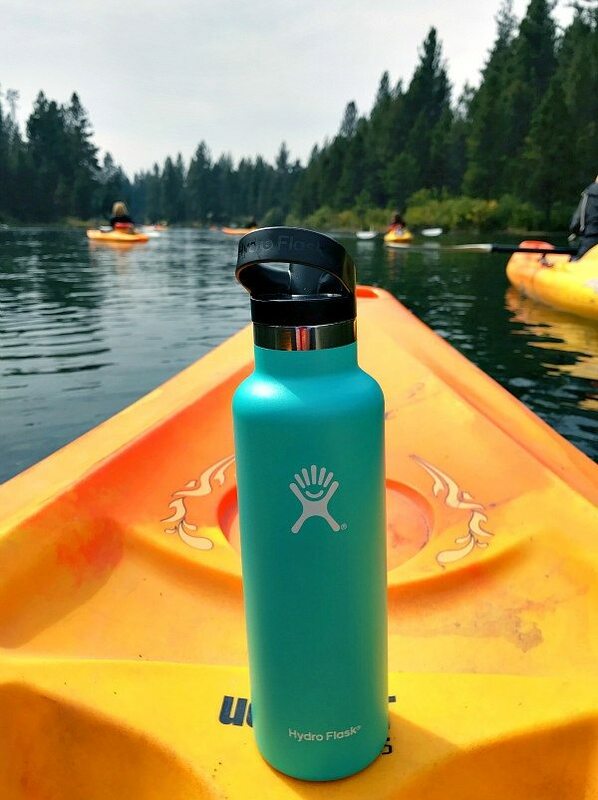 It’s a company that is based in Bend, Oregon (adjacent to Sunriver), and they supplied all of us with these colorful Hydro Flasks for our adventures in Sunriver! The cool thing about them is that you can put an iced beverage in there and it will stay cold for a very long time (the ice doesn’t even melt), or you can put a hot beverage in there and it will stay nice and toasty. I’m a fan! Anyway, back to this gorgeous river. 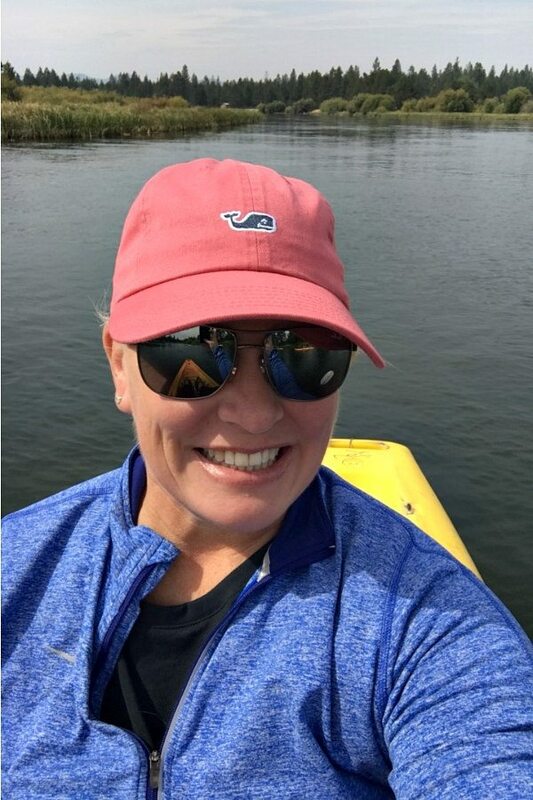 We paddled off into nooks and crannies of the river and loved seeing how the color of the water changed. Some areas were so clear and pretty, and some were murky and cool. 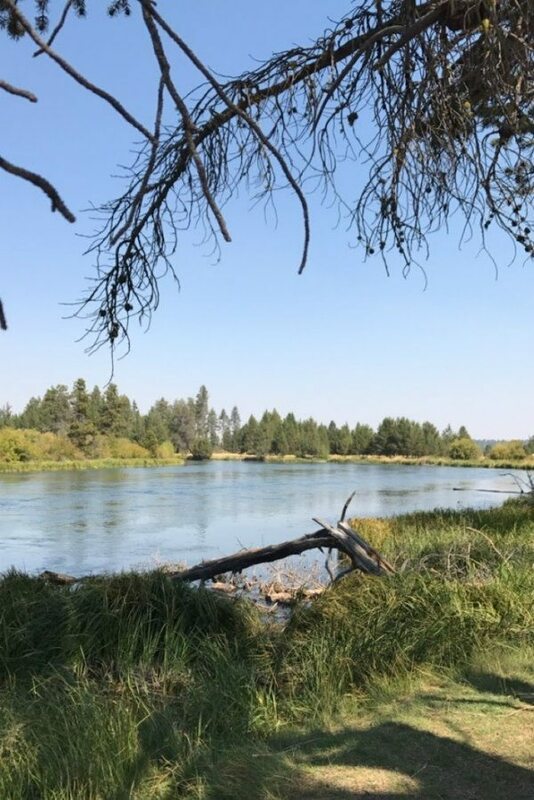 One of the most awesome things about staying in Sunriver is the bike trails. You truly do not need to have a car here at all. 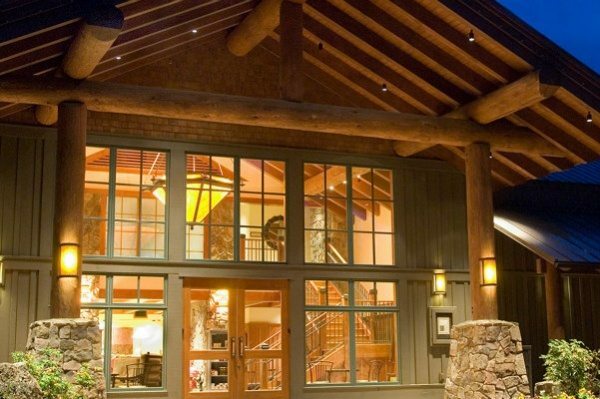 Sunriver Resort will come and pick you up at the airport and bring you to the lodge or to your rental property. Then you can either utilize the shuttle to go places while you’re there… or you can rent bikes and bike everywhere! The bike trails are all over this resort town, and you can bike anywhere and everywhere to get where you need to go. Of course, if you’re there in the winter… you may wish to utilize the shuttle system or rent a car. But later spring/summer/early fall are perfect for biking! In the center of town is a group of restaurants, shops, market and coffee shop. We biked into town, parked our bikes and didn’t even have to lock them up. Everyone is on bikes in this town! You’ll see lots of these guys while cruising around the resort. The trails run all along the river, so it’s always a beautiful ride. 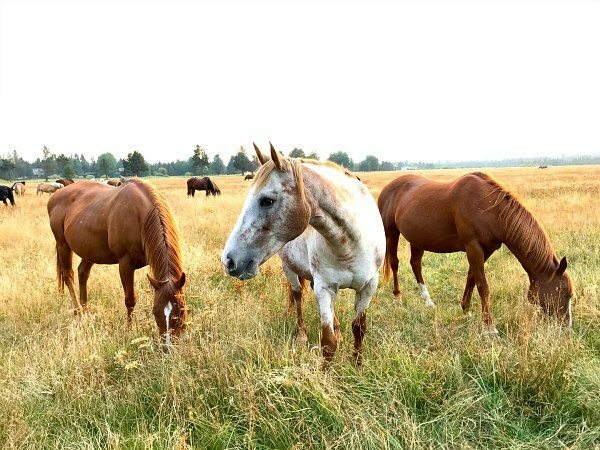 Horses are plentiful in the meadows. Ranch houses are abundant in these parts of the resort. The horses have plenty of room to roam. 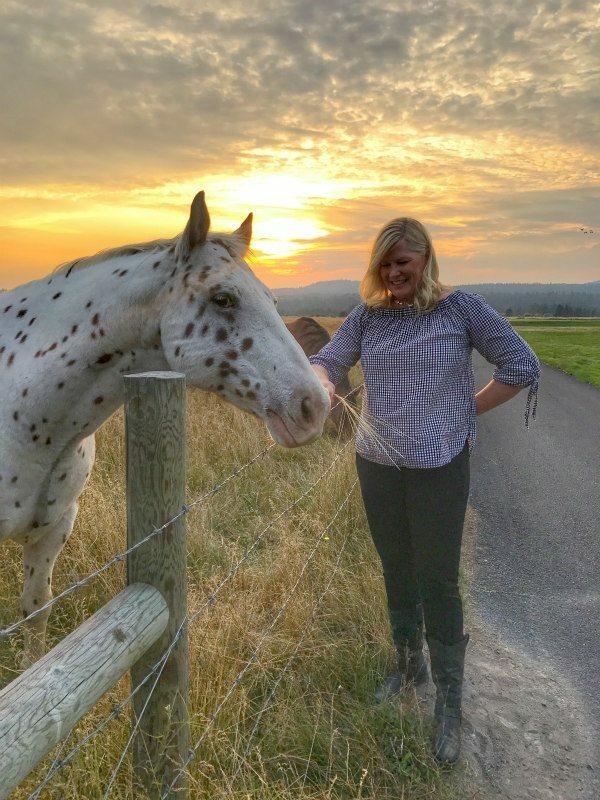 If you’re staying at the lodge, or if you’re biking along the paths… you can stop and pet the horses. They’ll come right up to you. You can also choose to go horseback riding as they have places where you can ride the trails with a guide. Clearly, I found my own sweet friend. 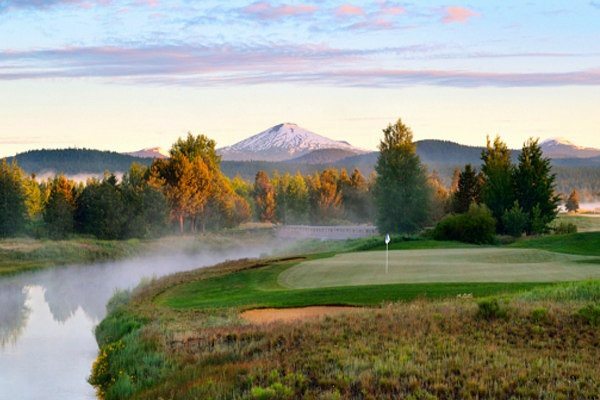 Now can you see why Sunriver is a heavenly place to vacation?? I can’t wait to come back here with my family. 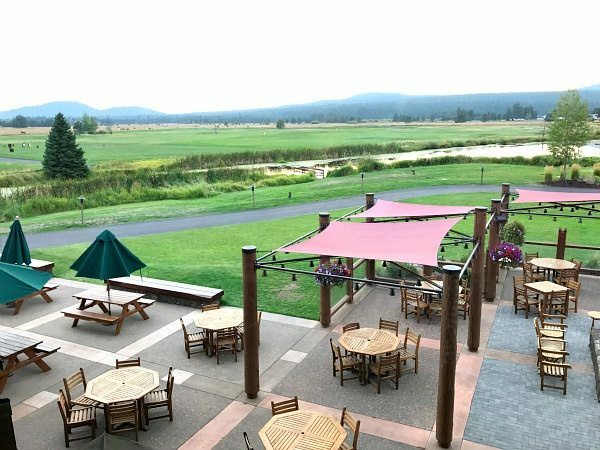 There is a little something for everyone at Sunriver Resort. If you get a chance to come to Oregon, I highly recommend this place! 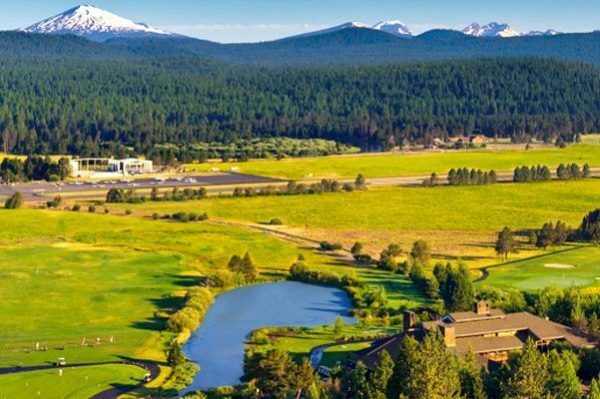 For more information: visit their website: SUNRIVER RESORT. Disclosure: Sunriver Resort sponsored my stay in Sunriver. 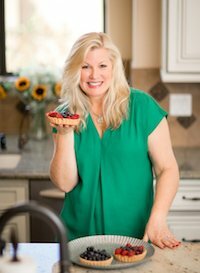 I am grateful for their generosity as I am so excited to share it with my readers as an awesome place to vacation. 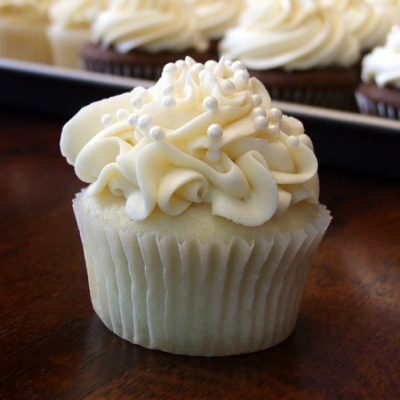 There are Amazon affiliate links included in this post. Can you all come back? 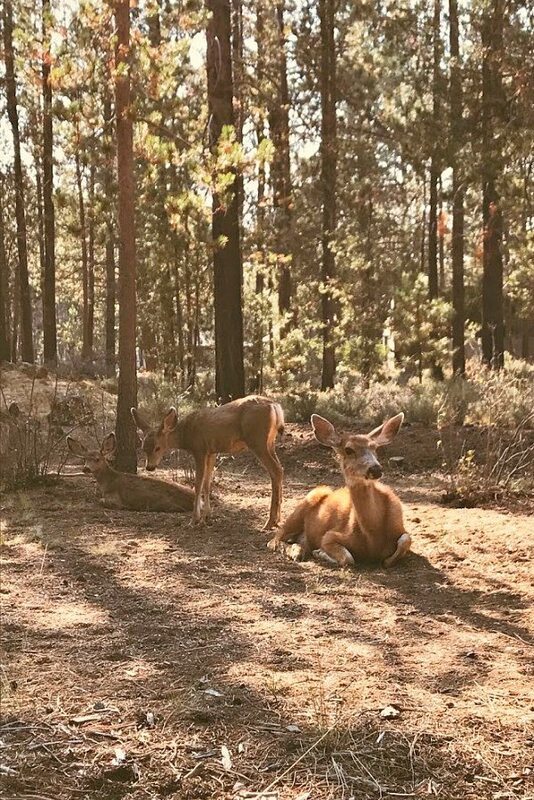 What a dreamy weekend together at Sunriver Resort! 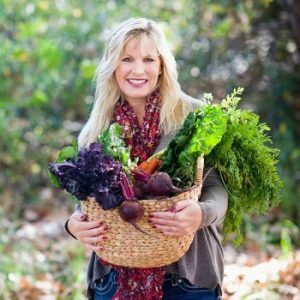 It was so much fun following your trip on Instagram! What a beautiful place! Oregon is definitely on our list to visit soon.